I apologize in advance, but there are no public/private tours/visits available at PDO due to insurance and security considerations. PDO is set up for imaging-only research and so there are no facilities for visual observing. 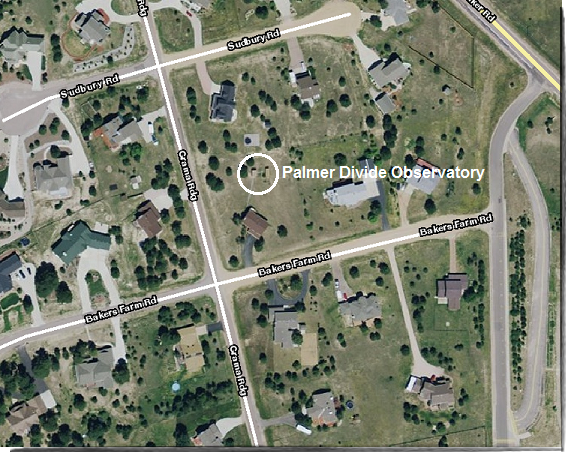 The Palmer Divide Observatory is named after the geological feature on which the observatory is located. The "Divide" is an east-west ridge that juts out from the Front Range of the Rocky Mountains between Colorado Springs and Denver, CO. The elevation is about 7600 ft. in the subdivision located approximately 9 miles east of Monument, CO, and 25 miles north of Colorado Springs, CO. Most work is dedicated to the determination of asteroid lightcurves with some variable stars and astrometry mixed in from time-to-time. Special concentration is given to the Hungaria group of asteroids as well as Mars-crossers since these have a higher potential for being binary. So far, work at PDO has lead to the initial discovery of more than a dozen binary asteroids and provided confirming observations for several others. The aerial photo at left was taken before the second building, housing the three 0.35m SCT telescopes, was built. It was also well before a housing "boom". There are now about 50 "McMansions" located in the open area on the left side and at the top of the photo. One even has a two-level garage that holds seven vehicles! Telescope: Jerry Foote, ScopeCraft, Inc. This page was last updated on 01/20/11 09:54 -0700.